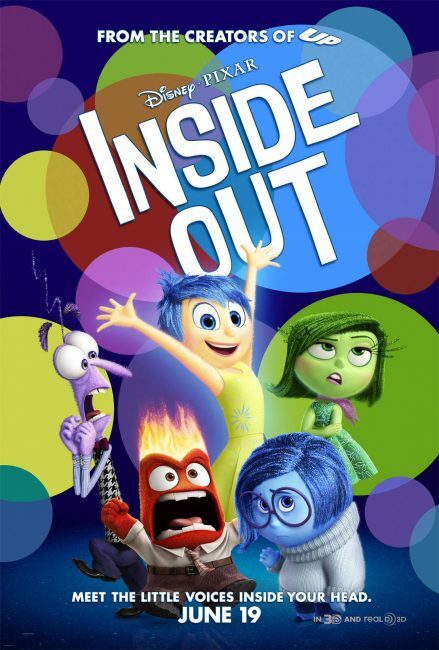 Inside Out: Movie review, free printables and giveaway! Home Disney TipsDisney Entertainment	Inside Out: Movie review, free printables and a giveaway! If you haven’t seen the movie Inside Out yet, you are in for a treat! I don’t know how Disney PIXAR does it again and again, but Inside Out is truly one of my favorite movies this year. Read on for my Inside Out review, free coloring pages and a $100 Fandango gift card giveaway! Oscar and I screened the film and had the best time! Inside Out is laugh-out-loud funny, sweet, thought-provoking and really smart. Leaving the theater, we loved talking about our favorite parts and laughing together on the way home. In a nutshell, Inside Out is for everyone. This movie is primarily being billed for tweens in the media and that makes sense because the emotions live inside Riley’s mind and she is 11. But if your kids are older or younger, please don’t let this deter you from the film. 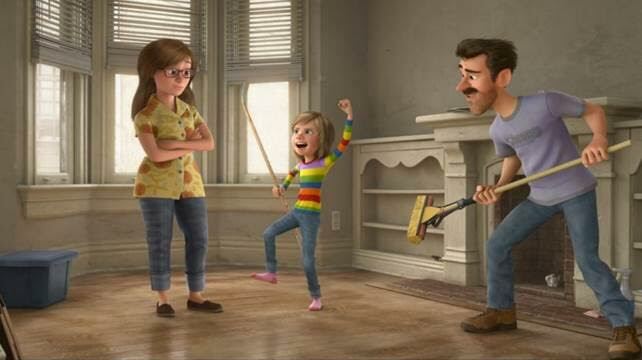 Inside Out is truly a story for all ages and one I know my family will enjoy again and again. This movie strikes a chord with both kids and parents who are trying to navigate an ever-changing world that can be really confusing. As a parent, I sometimes have to remind myself that I have never done this before. Life is just one new thing after another and to sound cliche, the only constant in life is change. Inside Out does an incredible job of teaching viewers of any age that it’s ok to admit transition is hard. It’s ok to be sad and confused and excited all at the same time. Riley has parents! Like as in TWO of them!! And they don’t die! As an avid Disney movie watcher and lover, I will not be the first to point out that many (if not most) Disney families are broken. Sometimes it’s never explained (looking at you Andy’s Dad ) and sometimes it’s very tragic, um hello Tarzan . And I get it. That paints a picture of adversity and triumph and makes for a good story. That said, I was thrilled to see Riley in a family with two loving and involved parents who weren’t perfect but were doing the best they could given the situation. The story wasn’t sensationalist. It was everyday life. I think that is a huge reason for the movie’s success. We all feel like those frazzled parents trying to find the moving truck or adjusting to a new job from time to time. When the movie took us inside the minds of Riley’s parents, the theater erupted with laughter. It was a great scene, but what struck me was how every adult in that theater seemed to be leaning over saying omg yes! This! I don’t have a single negative to share about this movie. See it. Love it. Own it. And make sure to get there early for the best short film I’ve seen in a long time. Lava will make you smile from ear to ear and put the sweetest song in your head on repeat. As a ukulele fan, this one was especially sweet for me! $100 Fandango Gift Card Giveaway! Getting the whole family to the movies isn’t easy. Especially if you all want to go together. So, I am partnering with Fandango to give one of my readers a $100 Fandango gift card! Yay! To enter, use one or all of the following options. One winner will be randomly chosen and notified by email. U.S. entries only please. Thanks for reading and good luck! 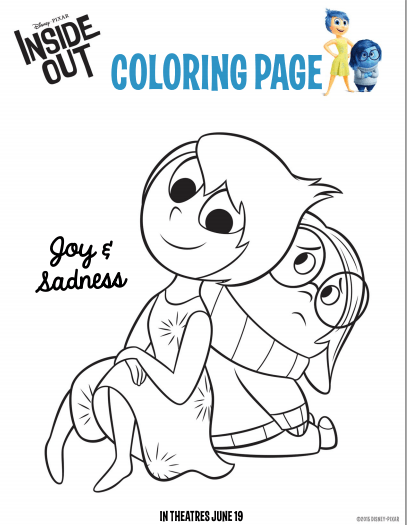 If you aren’t ready to shop for Inside Out goodies just yet, let your kids get in on the fun right away (and for free) with these Inside Out coloring pages. Click the image to open the set and print. Enjoy! I hope you love Inside Out as much as we did. Don’t forget to enter the giveaway and good luck! This review and giveaway made possible by Fandango Family. All opinions are my own. Post contains affiliate links. i can’t wait to see this movie on Friday with Zeke! We are taking him to celebrate Kindergarten. Wait, how do I have a kindergartener?! We loved this movie! Definitely on the to-buy list. We haven’t seen it yet, but we REEEEEAAAALLLLY want to!!!! Loved loved loved this movie!!! Inside Out looks adorable! Cant wait to take my daughter to see it! I have seen this movie before and cried my eyes out! Yes took my 4 year old to see it the Saturday after it came out. I had to do a count down each day until it came out, he was so excited to see it. We haven’t seen it yet, but can’t wait to see it! My hubby and I are planning to see it next week for date night! I haven’s seen this movie yet but am looking forward to taking my nieces to this. we haven’t seen it yet, but I really want to! This would be great for the long hot summer days! We haven’t seen it yet, but I was wondering about the parents! Thank you for including that! Liv is such a little worrier that I’m looking forward to using this movie as a convo starter about being ok with feeling all the feels, but not letting them run the show. Your review was super helpful! I can’t wait to see this movie! I have teens — 15 & 17 — but I think they’ll enjoy this just as much as I will. I’ve only heard raving reviews! My boys and I all loved this movie! After seeing it with my kids this past weekend I need to see it again alone to process all of the emotions I was feeling during the movie! I am excited to see Inside Out with kids. No we have not seen Inside Out yet, but we plan on seeing it this weekend with the kids. We will be going to see it this weekend. We had to go see Jurassic World first this past weekend because my grandsons are BIG dinosaur guys. So this weekend it’s Inside Out. We both can’t wait (me and little girl) because … Mindy Kaling! I have not seen the movie yet but I am super excited to see it! When I first saw the trailer, I thought EH. But after hearing how great it was I thought, well we must see this. It was SO GOOD. It’s one of those movies that’ll stick with me for a long time (and OMG Bing Bong). That short film? Oh my heart! I haven’t seen it yet but I really want to! I absolutely loved the trailer!